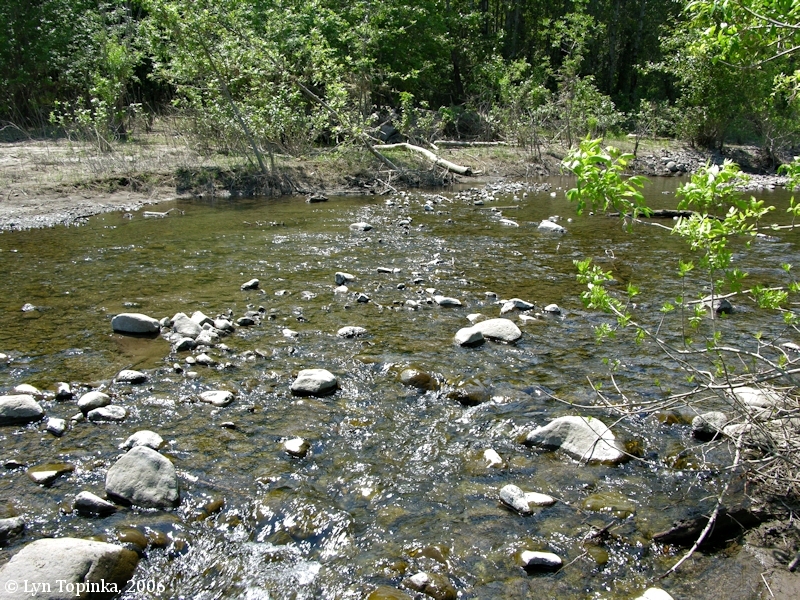 Click image to enlarge Woodard Creek, Washington. View looking downstream. Pierce Island is in the background. Image taken May 13, 2005. 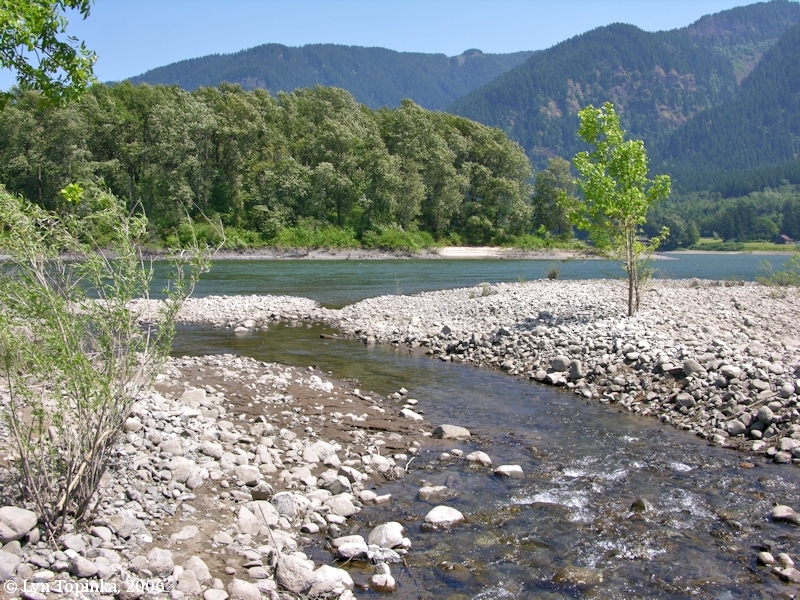 Woodard Creek (often seen as "Woodward Creek") is located on the Washington State side of the Columbia at River Mile (RM) 142. 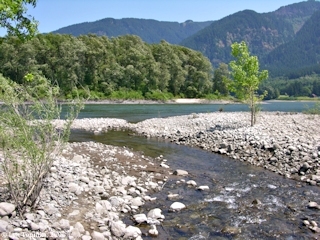 The mouth of Woodard Creek enters the Columbia River behind Pierce Island and downstream of Beacon Rock. 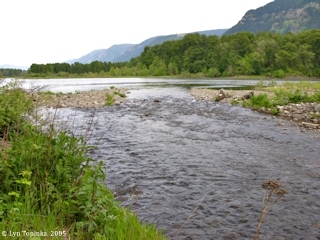 Woodard Creek lies upstream of Duncan Creek, Skamania Landing, and the small community of Prindle. Across the Columbia is the community of Warrendale, Oregon. Lewis and Clark spotted Woodard and Duncan Creeks on November 2, 1806. The 1860 federal census for Skamania County, Washington Territory, has an entry for John D. Wooded, age 32, farmer, and his wife Sarah C. Wooded, age 20, and two children, Richard Wooded, age 2, and Wm. C. Wooded, age 5 months. 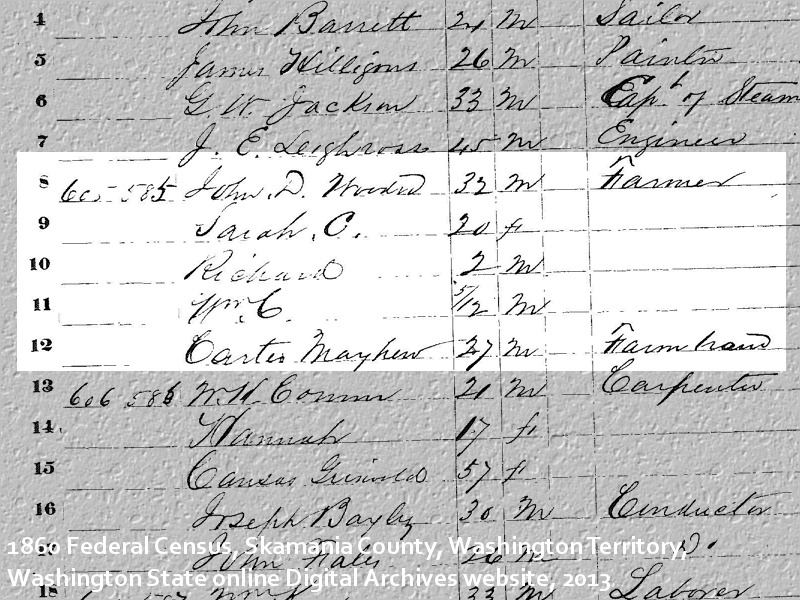 A digital image of the original census report is online at the Washington State Digital Archives (2013). The actual handwriting entry seems to list the last name as "Woodrd". The U.S. Bureau of Land Management, General Land Office Records, show a John D. Woodward being issued a land title on November 22, 1865, for 186.02 acres of parts of T2N R6E Sections 35 and 36, under the 1850 "Oregon-Donation Act". The 1911 U.S. Geological Survey's 1:125,000 topo map for "Mount Hood and Vicinity" has "Woodward Creek" and "Duncan Creek" named. In 2007 the U.S. Geological Survey's Board of Geographic Names made "Woodard Creek" the official name. 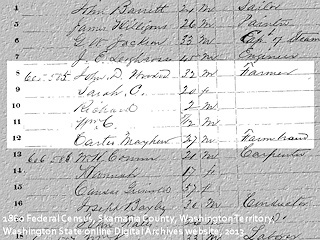 Click image to enlarge HISTORICAL: detail, 1860 Skamania County Census. Click image to enlarge Woodard Creek, Washington. View at mouth, looking downstream, with Pierce Island. Image taken July 2, 2006. Click image to enlarge Woodard Creek, Washington. View at mouth, looking upstream. Image taken July 2, 2006. Wil "Nootka Roses" are found throughout the Columbia River Valley. 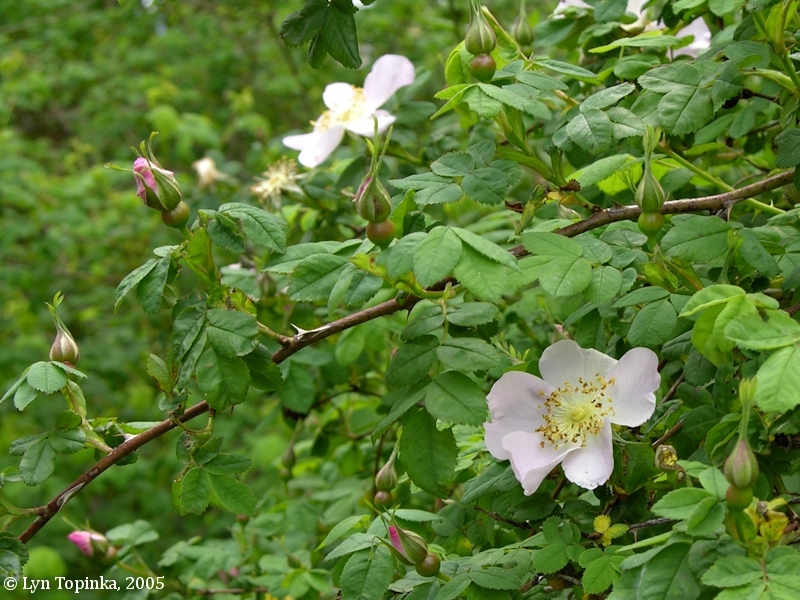 Captain Lewis writes about the wild roses in his journal at a camp in Idaho while on the return journey, although both he and Captain Clark mention the wild rose throughout their journey. 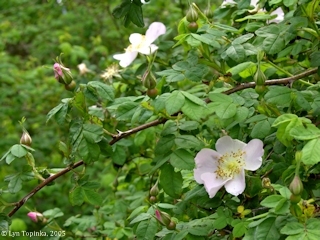 Historians have identified these two roses as the Nootka Rose (Rosa nutkana) and Wood's Rose ("Rosa woodsii, or the Western Wild Rose). Both were undescribed species at the time of the Lewis and Clark journey (Moulton, vol.8). The "Wild Rose" is a plentiful throughout the woodlands of Washington and Oregon. 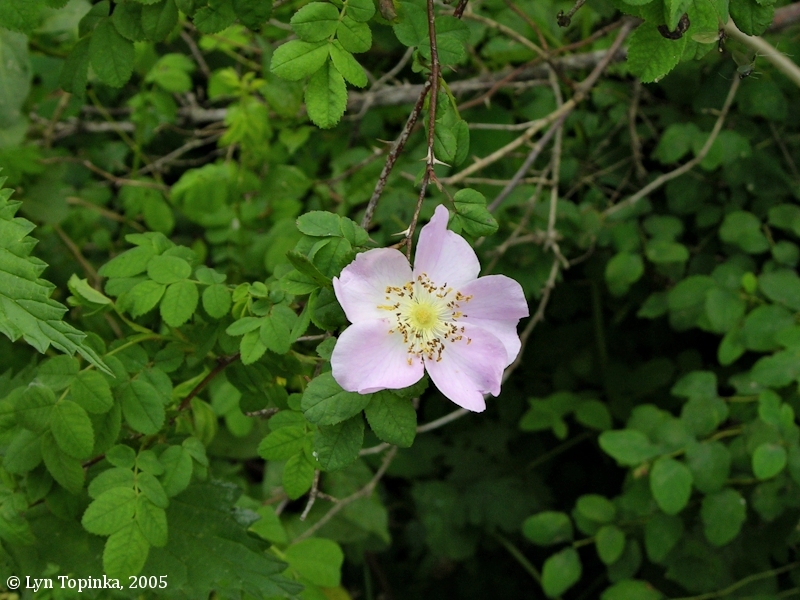 Click image to enlarge Wild Rose, Columbia River Gorge. The Nootka Rose. Photographed near Woodard Creek, Washington. Image taken May 13, 2005.